Go beyond the myths of the American South and explore the complex and intimate relationships of 4 generations of one Louisiana Creole family, both free and enslaved at Laura: A Creole Plantation, a major sugar plantation located on the banks of the Mississippi River, just one hour from New Orleans. 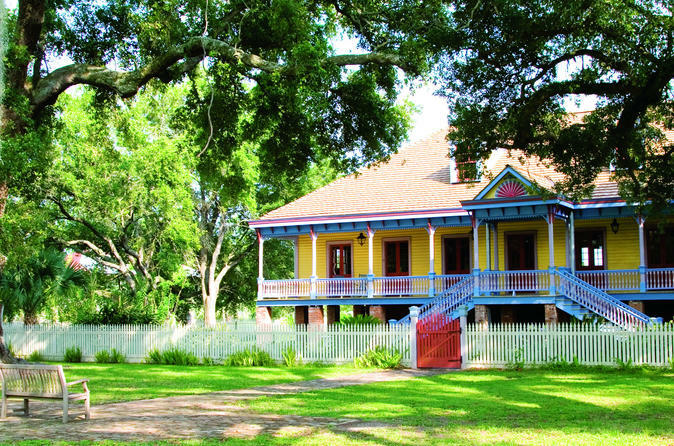 Your admission includes a 70-minute tour with a knowledgeable guide who shares the rich history of Creole culture as seen through the lens of the family who owned Laura Plantation for generations. Tour the main house, grounds and slave quarters as you gain insight into the people who lived and worked here for centuries. Make your own way to Laura Plantation, located an easy 1-hour drive from New Orleans and the French Quarter. Located on Great River Road in the heart of New Orleans plantation country on the banks of the Mississippi River, Laura Plantation provides a window into the Creole culture that thrived in Louisiana for more than 200 years. Your admission ticket to the plantation includes a 70-minute guided tour that details four generations of the Creole family that owned this plantation. Follow your knowledgeable guide on a tour of the 24,000-square-foot (7,315-square-meter) main house, as well as the slave quarters, three gardens and sugar fields. Throughout the tour you learn about the family who owned the plantation, which was founded in 1804 by Guillaume Duparc, a French veteran of the American Revolution. A rich trove of family history is known, thanks to extensive documentation about the plantation discovered in the French National Archive in addition to the handwritten memoir of the last family member to own the plantation, Laura Locoul. Her book, Memories of the Old Plantation Home, was penned in 1936 in St Louis, Missouri, and is the basis for much of the tour. Laura Plantation is one of only a handful of plantation complexes that have survived so intact. Due to its historical importance, it is listed on the National Register of Historic Places and the Louisiana African American Heritage Trail. After your visit, you can continue on your own to explore neighboring plantations with a different cultural influence as well as try some tasty Creole cuisine at nearby restaurants.